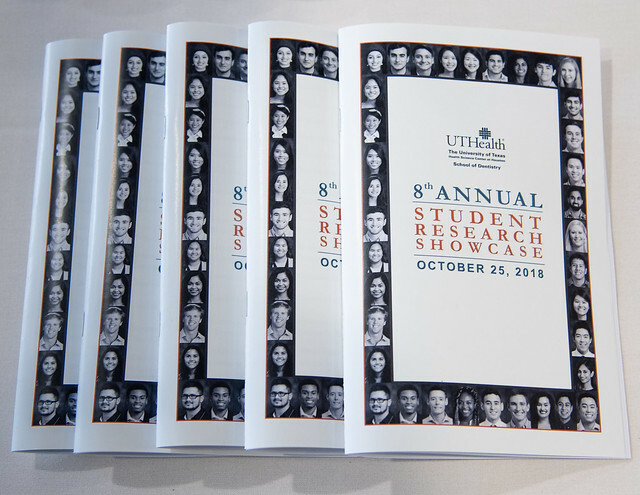 Speaking on the topic of “Pluripotent Stem Cells: Opening a New Avenue for Skeletal Regeneration,” University of California at Los Angeles School of Dentistry Dean and Professor Paul H. Krebsbach, DDS, PhD, delivered the first William T. Butler Distinguished Lecture at UTHealth School of Dentistry’s 2018 Student Research Showcase in October. This year’s lecture was named in memory of Professor Emeritus William Thomas “Bill” Butler, PhD, a School of Dentistry faculty member from 1987 to 2004. Fourth-year dental student Gilberto Garcia Jr. won the event’s overall first prize for “Targeting the Epb Pilus with a Monoclonal Antibody to Decrease Enterococcus faecalis Colonization of Dentin.” Garcia also won the American Association for Dental Research Student Research Day Award. His mentor was Assistant Professor Ransome van der Hoeven, PhD, basic science section head in the Department of Diagnostic and Biomedical Sciences. Mohammad Eyad Albaba; mentor Dharini van der Hoeven, PhD.